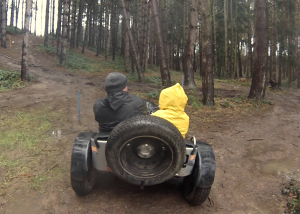 Push your nerves and your quad bike to the limit with this fantastic off-road activity! Tackle mud, water, and hills through 200 acres of stunning countryside, with full training & equipment provided. The perfect day out for all petrol-heads, this is a fantastic quad bike experience which guarantees you an action-packed day of off-road fun! You can’t beat the power and strength that quad bikes possess, or the thrilling high you get from riding one over rough terrain. During your quad biking experience in Kent, you will have the chance to ride through over 200 acres of beautiful countryside, negotiating a variety of difficult terrains as you make your way around the grounds. The quad bike is arguably one of the most exciting driving experiences you can get! If you have a need for speed and are looking for a thrilling and memorable day out, then this fantastic quad biking experience is for you!Once you have arrived and been welcomed to the centre near Maidstone, your quad biking experience will kick off with a safety briefing. This will cover the terrain you will be driving on and the technicalities of the quad bikes. Once briefed, you'll be ready to begin the day's driving with a thrilling obstacle course to navigate - bend under the limbo bar, accelerate over the see-saw and carefully manoeuvre the parallel logs! Following the fun-filled obstacle course you'll then follow the instructor out into open land, crossing fields at speed and navigating tight corners and deep trenches on your quad - prepare to get muddy! Your quad biking experience in Kent will end with a debrief from your instructor. The Quad Bike Experience in Kent is available most Saturdays throughout the year and occassional weekdays on special request. Under 16s must be accompanied by a participating parent or guardian. If you are particularly tall or short, or feel that your physique may impair your enjoyment of quad biking in Kent, please check with the centre when booking. 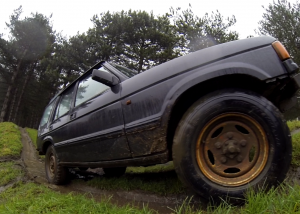 The obstacle course lasts approximately 20 minutes, and the quad drive lasts around 30. Please allow 1.5 hours for the overall experience in Kent, and arrive at least 15 minutes before your start time. Participants: The Quad Bike Trek in Maidstone is for 1 participant. Areas are provided for spectators to view. There is a pleasant indoor meeting space where refreshments are available. The centre in Kent will provide all safety equipment needed, but please wear comfortable casual clothing and footwear that you don’t mind getting dirty. In wet weather a change of clothes is advisable. Waterproofs are provided. 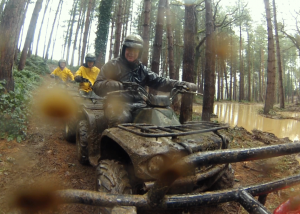 Quad biking in Kent can sometimes be affected by extremely adverse weather. if you are concerned about this, please contact the centre on the day to check. 2nd time on this experience and as good as the 1st. Would recommend this to anyone. When does the Quad Bike Trek in Maidstone run? The Quad Bike Trek in Maidstone runs on Saturdays. If you wanted another day then depending on availability, this might be possible. Can anyone under the age of 18 take the Quad Bike Trek in Maidstone? The minimum age for the Quad Bike Trek in Maidstone is 11. Anyone under the age of 16 must be accompanied by are participating parent or guardian. How long out of the 1.5 hours is spent on the quads on the Quad Bike Trek in Maidstone? You will be on the quads for around 1 hour out of the 1.5 hours at the centre for the Quad Bike Trek in Maidstone. What is the quad bike engine size? The quad bikes used for this experience are 150cc. Can the Quad Bike Trek in Maidstone cater for stag groups? The Quad Bike Trek in Maidstone can cater for group bookings, whether hen, stag, birthdays, corporate or even if you and some friends wanted to have a go. Is the Quad Bike Trek in Maidstone available on Sundays? No, the activity centre is closed on Sundays.